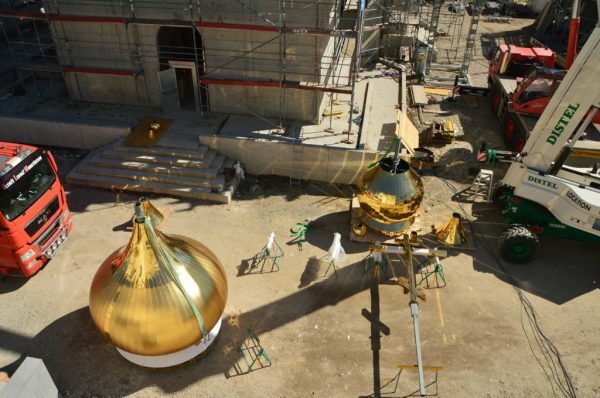 Strasbourg, March 30, Interfax - Central tent, cylinder and golden domes with crosses were set up on a Russian church of All Saints in Strasbourg. They were made in Moscow and brought to France in disassembled form in three trucks. Assembling of the domes took several weeks and took place in a town of Esho not far from Strasbourg, the parochial press service reports. Representative of the Russian Church to the Council of Europe, rector of the church Hegumen Philip (Ryabykh) consecrated the tent, domes and the crosses, officials of the building companies involved in the construction attended the ceremony. The building is carried out only on private donations. Today about 2,000 people from the whole world and several Russian companies contributed in erecting the church.